Chemistry comprises the study of matter – from sub-atomic particles to bulk materials – and is sometimes called the “central science.” Recent progress in chemistry leads to applications in such diverse fields as medicine, materials science, environmental science, fossil fuel and alternative-based power sources, energy security, forensic investigation, nanotechnology, and art conservation. The experimental and analytical aspects of Chemistry attract people who enjoy the challenges of problem solving by applying fundamental concepts and new skills to complex problems that were previously unsolved. Through rigorous coursework and laboratory experience, students will gain the knowledge and skills necessary to understand and address scientific problems that impact society, ranging from new therapeutics in medicine to “smart” plastics and electronics that respond to dynamic environments. As scientific issues continuously play a role in national and local policies, having a basic understanding of chemical principles empowers students to become informed citizens that can help maintain progress in society as new and evolving technological advances and concerns become significant. 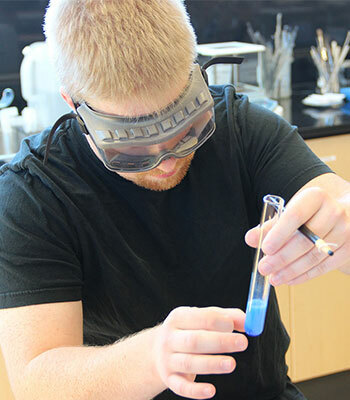 The Bachelor of Science in Chemistry program offers courses covering many aspects and sub-disciplines of chemistry, and allows for hands-on experience in laboratory courses and student-driven research projects. 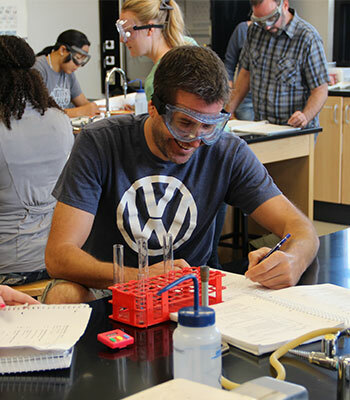 Through fundamental topics covered in general chemistry through upper-division courses in more specific areas, students will become familiar with the cross-disciplinary nature of Chemistry, and learn the vast fields of science that are impacted by concepts in Chemistry. The program therefore presents a cohesive and comprehensive coverage of chemistry fundamentals and how they are applied to the natural and anthropogenic world that surrounds us. The program also provides students with a firm foundation in integrated concepts associated with Physics, Mathematics, and Biology. Demonstrate knowledge of the skills required to make informed personal and social decisions about the issues that we will face locally as well as globally. Demonstrate knowledge of basic fundamental laws, concepts, and theories in the physical sciences and be able to apply them to everyday life. Understand the process of science — how scientific knowledge is generated and validated — so that they can make independent, empirical inquiries about the natural world. Demonstrate knowledge of the process of science by being able to interpret data in the form of tables, graphs, and charts and then communicate those findings in oral and or written form.